Here you’ll get help and answers to the most common questions that you might have about our events. Please choose your topic below. How do I take part of an event? Buy a voucher. Just click on the BUY button/link on the event page. Follow the instructions you got on the information page and in the email. Save your voucher code. When check in opens, do the check in via your mobile phone as instructed. The link can be found on our pages and in the email. Your mobile ticket will give you access to the venue(s) according to the event organised. If you’re a restaurant or bar owner and you’re interested in your venue being part of our event, contact us directly. My payment won't go through. Debit and credit card payment can be made either via Paypal or Paysera. Sometimes though, there may be problems in the chain that we can’t do anything about, and your payment doesn’t go through. In this case, we ask you to try using the other of these two, and you should be fine. What is a ticket and what is a voucher? The code you see on the screen and in the email you receive from us, is a VOUCHER CODE. This will not allow you to enter the venues, but it will get you your ticket in your phone at check in. 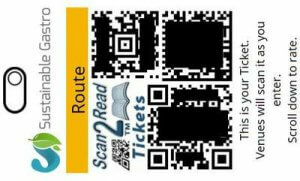 The ticket is a QR-CODE in your mobile phone (as below), obtained via checking in online on your mobile phone. The link for checkin and the date for checkin open is communicated in the voucher email and on our homepage. I can't check in, why? Make sure you’re not using private browsing or similar, as your ticket will be erased by the browser. We assume that you have internet connection at check in, and you’ve opened the check in page on your mobile phone, as stated in the instructions. Here you’ll see either a language selector, or a text box for you to enter your name. If yes, continue below. Otherwise, please try using a different browser, such as Firefox, Opera, Chrome or Safari. Make sure you enter first and last name. Then the next text box will show. Enter your voucher code, make sure to double check the characters you enter. Enter your email, again making sure you’ve spelled it correctly. Repeat your email, make sure it matches with what you entered above. This is where most mistakes are made. There’s no “submit” button, as the server automatically collects your input, and will shortly change the content and hand you your ticket. Your ticket isn’t downloadable, but it lives in the browser you used. Do bookmark this page, so that you have it readily available at the event. NOTE: You can only check in and have one ticket per browser/mobile phone. Should you do another check in on the same device and browser, you’ll cancel your previous ticket! Why do I need a mobile phone for the event? Our events contain both sustainability and technology. Among other things, here are some of the reasons we want you to go mobile! Save paper. No need to print tickets. You have your phone with you, and use it anyway for social sharing, right? Live survey. Cast your vote for the venues, flavours and service as you get first hand experience of them. You’re impression matters! See the locations you can visit with your ticket. Connected to Google Maps, easily find your way there. Later on the event evening, you get access to part of the voting results in your route. See what others thought. Did their experience match yours? …and this was just some of the highlights of our mobile app. Should everything else fail, you can print your ticket. But please don’t. I don't have free mobile data with my phone. That’s just fine. Here’s what will happen. You check in where you have free internet via WiFi, and get your ticket on your phone. Bookmark the page! For the live survey, the venues often provide free WiFi. Even if not, all your votes are saved on your phone, and when you do get an internet connection, all is uploaded at once. Can I have two tickets on one mobile phone? If you really must, there is a solution, for example if someone in your party doesn’t have a modern device. You can check in two people on one device, but you must use two different browsers. Recommended browsers are Firefox, Opera, Chrome or Safari. Again, make sure you’re not using private browsing or similar, as your ticket will be erased by the browser. Are the Gastro routes set in order? No. We trust you to make your own decisions, so you begin and end your journey at any of the venues in your route you feel like, and choose the order yourself. You can start any time you feel like according to the event start time. Please see each venue’s information on the route page of the event, as some small deviations may occur from the general hours. The Gastro venues are expecting you to arrive and enjoy their hospitality at any time during the event. As all our events are social, you can and probably will find yourself sitting next to other people, which is a really nice thing and will give your Gastro experience another dimension of enjoyment. Just relax and have a fun time! The short answer is, no. How does the live survey work? There’s no “Submit” or “Vote” button in the app, as it’s not needed. We’re saving your finger some clicking. As soon as you cast a vote it’s stored in your phone and sent to the server when an internet connection (mobile data or WiFi) is available. You can also change your vote when you’re at the venue, and your scores will be updated automatically. This is a classic. We don’t know. Neither does the bumblebee. It just does it, and we should all be happy with that. Scientists though, can’t just leave things be(e), and solved it. Now, you can also do the bug flap at home. When will you have the next Gastro? We like to keep some things secret. But sign up for our GDPR quality newsletter and follow us on Facebook, and you’ll get the news when it’s time to set things up.